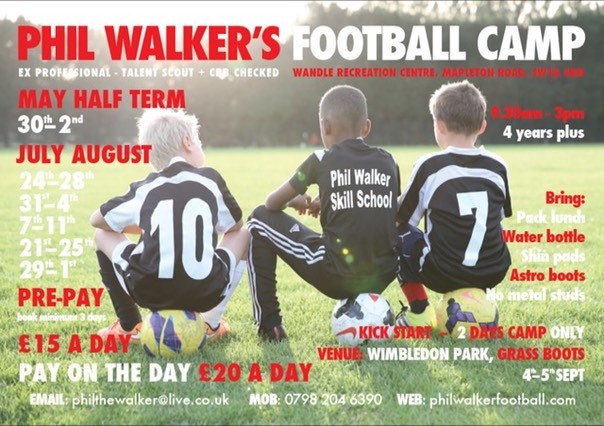 Every holiday and half term we run a football camp at the Wandle Centre where we provide technical and physical skills programmes for the kids. These programmes enable them to do things that they have probably never dreamed of doing. 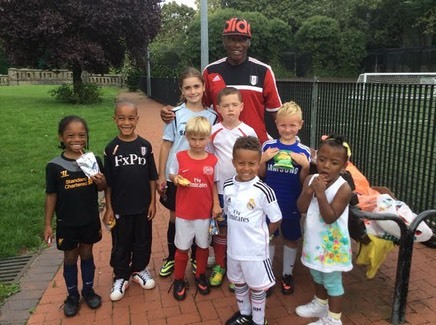 We coach kids from four years old upwards of all abilities and levels, teaching them skills that they see the professional footballers do on TV. We provide dedicated coaches whose goals are solely to develop and improve the kids' ability, both with and without the ball. We also give out medals and certificates and if you book and pay in advance for three days or more your child will also receive a trophy. If you book and pay for the full three weeks in advance the trophy will be engraved with your child’s name. We need at least two weeks notice before the camp for this. There are programmes also for kids who just want to play games and tournaments. The camp is for boys and girls from four years to 16 years old. There are three things that you should expect when your child attends a football camp: that your child is in safe hands and well looked after. They should learn new football skills or improve on the skills they already have. They should use up enough energy so that when they go home all they want to do is eat, go to sleep and be up early, ready for the next days session. These camps not only help with your child's physical fitness and well-being, they also help with their social skills and their ability to interact with other children of mixed ages. Walk with us, let your child dream.